To call Pokemon GO a phenomenon is probably understating it a bit. While it's not the first mobile app from Nintendo, it is the first mobile game from the company, made possible by the development chops of the augmented reality pioneers at Niantic. 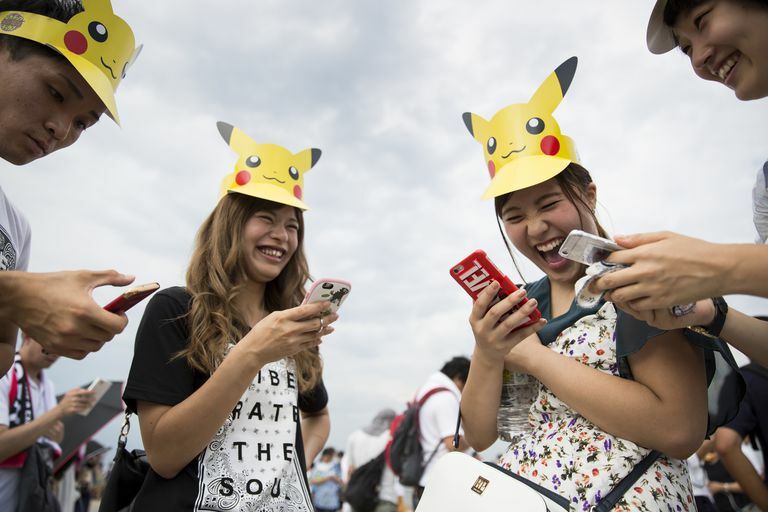 But while the release of Pokemon GO was highly anticipated, no one could have expected that it would fly to the top of both the free app and top-grossing charts, taking the iOS world by storm. Almost counter-intuitively, this unprecedented success has come despite the fact that the game’s launch has been buggy and new players get very little direction when they fire up Pokemon GO for the first time. Read on and you’ll be capturing Pokemon on your iPhone or iPad like you were born to be a trainer. More than one observer has pointed out that Pokemon GO seems to be lacking a point. It’s not the kind of game you can “win” by finishing every level. You could catch every Pokemon that is in the game, but we all know the developers will simply add more as time goes on. Ostensibly, there’s an in-game reason for exploring the world and catching Pokemon, as a kindly professor needs some help with his research. Your job is to go out and catch the pocket monsters in the wild -- and yes, you really do need to travel around to get the most out of the game. That’s where Niantic’s special expertise comes in. Like their previous game, Ingress, Pokemon GO uses your phone or tablet’s GPS sensor to determine your location, populating the world around you with more or less appropriate Pokemon (see Magikarp for the “less” part of that sentence). It also uses your camera to make it appear you are facing off with the ubiquitous creatures in the real world. You can also turn off the AR aspects with just a tap, but that kind of defeats the purpose. Once you’ve located a Pokemon out in the wild — or in your home, if you’re fortunate enough — you’ll want to catch it and add it to your collection. You do that via the time-honored tradition of throwing Pokeballs at it, which never makes them quite as upset as you might figure. Simply tapping on a nearby Pokemon on the main map will enter you into a showdown, with the camera using wherever you happen to be standing as the backdrop. To throw a Pokeball, simply swipe up from the picture of the red and white sphere at the bottom of the screen. Sounds simple enough, but it might take you a few throws to get the hang of it, as you need to flick in the right direction and with the right relative speed to hit the Pokemon. Tougher, rarer creatures might require more than one throw, but don’t throw wastefully. Even though they’re easy to replenish, your supply of Pokeballs is not unlimited. In-between catching Pokemon, you’ll want to check out the PokeStops in your vicinity. On the map, a PokeStop looks like a thin blue tower with a cube on top, and they’re mapped to landmarks in the real world — often churches, libraries, statues, fountains, historical markers and the like. As you walk, you’ll notice your trainer avatar gives off a pulsing blue circle. Once you get close enough that the PokeStop appears in that circle, it will change shape to have a large blue circle on top. Tap on it and you’ll see a picture disc, which you can spin by swiping across. Doing so will produce a variety of free items, including Pokeballs (told you they were easy to replenish). It pays to visit the PokeStops around you often, especially because they recharge often. A recently used PokeStop turns purple, but it will revert to blue when you can hit it up for supplies again. The other benefit of visiting a PokeStop is that it could yield a Pokemon egg. You’ll never know what may hatch from it, but it’s a good method for adding to your collection when there aren’t many Pokemon in the surrounding area. To hatch an egg, it needs to be incubated. Lucky for you that one of the things that otherwise not very helpful professor gave you was an incubator. Simply head to your Pokemon inventory, swipe over to see the egg, then tap on it. You’ll see any unused incubators below and can tap on one to start the process. There’s just one catch: The incubator is powered by your walking, and you’ll have to cover a specified distance of at least 2 km (approximately 1.2 miles) to hatch the egg. The people who made the game want you to get out and move around, and this is one way to ensure you do it. Once you’ve captured a Pokemon, you can tap on it in your collection to see its combat power, vital stats, attacks and more. There’s even a record of when and where you caught the Pokemon so you can remember you grabbed one on your aunt’s lanai (when she wasn’t home, but hey). While there isn’t a ton of combat in Pokemon Go at launch, to be prepared for the fights to come, you’ll want your Pokemon to be as powerful as possible. Doing so means using two different resources, but also making some tough decisions. Every time you catch a Pokemon, you’ll be rewarded with two things: stardust and candy. The former is universal, while the latter is specific to that type of Pokemon. You can spend a few hundred stardust and one or more pieces of candy to power up any Pokemon, leading to an increase in combat power and HP. The other option is to save up your candy because gathering enough allows you to do the evolution. As experienced Pokemon trainers know, evolving bumps the monster up to a more formidable form, boosting all stats and opening up new attacks as well. The choice is yours, but here’s a tip: Spare Pokemon can be given back to the professor for extra candy. So if you want to evolve Pidgey into Pidgeotto, simply catch a lot of the buggers and swap all but one of them back for more candy. Now we’re getting into slightly more advanced parts of the game, but once you reach level 5 — earning XP by catching Pokemon and visiting PokeStops — you’ll unlock Gyms. These are also located on notable places in any given area, but they’re much more obvious on the game map because they appear as really large towers. First, you’ll be asked to join one of three teams: Spark (yellow), Mystic (Blue) or Valor (red). The consensus is that your team choice doesn’t affect the game in any way, so feel free to just pick your favorite color. When you encounter Gyms, you’ll see if your team controls it by what color it is (totally unclaimed Gyms are silver, but let’s be honest, those probably don’t exist anymore). If the Gym is controlled by your team, you can tap on it and assign a Pokemon to help defend it. That unlocks the ‘Defender Bonus’ icon in the in-game store, which you can hit up for free stardust and PokeCoins, the game’s in-game currency, approximately once per day. Attacking a gym controlled by another team is somewhat outside the scope of this beginner’s guide, but if you simply are itching for a fight, you can bring up to six Pokemon to battle. Tap for basic attacks, hold down for special attacks and swipe left or right to dodge enemy attacks. And good luck, because Gym battles don’t always work right and are usually nigh impossible when they do. Tapping on the backpack icon in the main menu will allow you to see the items you own. You start the game with the ability to carry 350 items total, meaning your trainer must have one XXL backpack indeed. Egg Incubator: As noted above, helps to hatch Pokemon eggs as you walk. You start with one free incubator, gain a second one at level 6, and can buy more from the store with PokeCoins. Camera: Used to take all those hilarious pictures floating around the internet of Pokemon in the darndest places. Incense: Helps lure Pokemon to your area for 30 minutes. Useful when you can’t travel but know there are Pokemon relatively nearby. Revive: Brings Pokemon who have “fainted,” otherwise known as getting knocked out in a Gym Battle. Restores the Pokemon to half of its max HP. Potion: Healing item that restores 20 HP to a Pokemon. Lucky Egg: Doesn’t give you a new Pokemon but instead grants you double XP for 30 minutes. Still useful. Lure Module: Feeling social? This works like Incense but has to be used at a PokeStop, as it plugs into the slot above the picture disc. Other players can take advantage of the lure effect as well. Bag Upgrade: Allows you to carry 50 more items. Pokemon Storage Upgrade: Allows you to have 50 more Pokemon in your collection. While buying items is always an option, don’t forget that you’ll find plenty of the basics, like Pokeballs and healing items, just by visiting PokeStops on a consistent basis. If you do come by some PokeCoins, it’s wise to save them for the Lure Modules and storage upgrades.